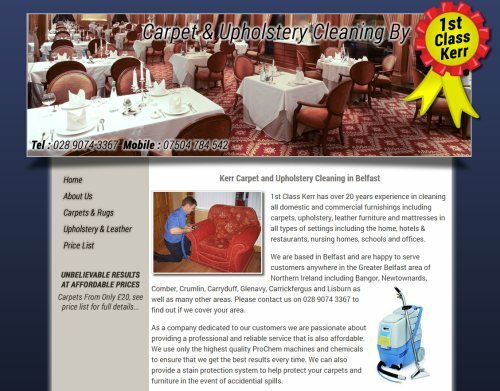 With over twenty years experience in Carpet and Upholstery cleaning, 1st Class Kerr are a natural choice for customers throughout Belfast looking to clean carpets or upholstery either in a domestic or commercial setting. The company provide free quotes and estimates together with a free stain removal and deodorising service to customers throughout Greater Belfast. We’ve helped 1st Class Kerr build a brand new website so that customers can find out about their excellent services.